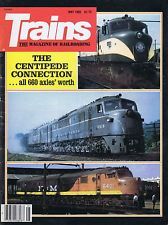 In 1982, Trains magazine published an extensive article on a most unique locomotive: the Baldwin Centipede. The Centipede was a product of a unique moment in American railroading. Steam-locomotive builders were reluctantly concluding that the future really did belong to diesels. Railroads, even the ones that depended upon coal traffic, had already reached that conclusion, and were scrambling to dieselize as fast as they could. Unions were facing a major paradigm shift in how motive power was operated and maintained by their members. The Centipede turned out to be a spectacular failure. Too unreliable for the passenger service the Pennsy had intended them for, they were demoted to helper service out of Altoona, to mixed success. (At least it was an easy downhill trip to the shops.) As soon as traffic and amortization permitted, the Pennsy retired and scrapped the whole fleet. So, thirty years went by. I had gotten out of N scale, and gotten back into it again. Product selection and quality had increased tremendously in the meantime. Two years ago, Frank was ringing up my purchase at the hobby shop when he casually mentioned that N scale Centipedes had been announced. When I looked at the catalog page he showed me, that long-forgotten desire came rushing back. I had him fill out a pre-order slip on the spot. Four weeks later, the hobby shop burned down. In the uncertainty that followed, I considered placing another order elsewhere, but hesitated. This particular model was a rather pricey proposition, after all. Despite my desire, I wasn’t eager to repeat the whole Broadway Limited incident with my wife again. When I saw Frank at a show, several months later, I asked if my order was still on. He said he’d check. More months went by. I didn’t hear back from him. Construction started on a new shop where the old one had stood. I obtained the money for the locomotive, and then bought an oscilloscope with it instead. When the new shop opened last summer, I made the pilgrimage via bicycle to see it. Frank was back at the register again. …and passed right by, with no Centipede. The ship date, already six months behind, had been pushed back another month. Throughout the fall, it kept getting pushed back still further, a month at a time. Right past my Christmas bonus. Whew. That was a close one. In late January, I joined a number of my clubmates for the trip to the big train show in Springfield, Massachusetts. This show attracts a lot of manufacturer exhibits, and sure enough, BLI was there, and they had a Centipede on display. Even without seeing it run, I was instantly reassured that I hadn’t spent all those years in pursuit of some mythical beast. N scale Centipedes were indeed reality. When I visited the shop two weeks later, it was waiting for me. I handed over the appropriate quantity of crisp Ben Franklin portraits, and took it home. Well, it’s big, for starters. Really big. Each unit is 91 scale feet long—that’s about 7 actual inches, longer than any of my other rolling stock. It absolutely dwarfs my Kato GG-1, which is not exactly a small locomotive. I can’t run it over the Gopher Valley Central, of course. That has 8-inch curves and tight clearances. BLI claims it can handle 9-3/4″ curves, but I see no point in trying. It runs fine around the 11″ curves of a T-Trak module, but looks absolutely absurd doing so. In fact, it still looks absurd on a 15″ curve. I was disappointed by track-power pickup, at first. Each unit has sixteen wheels that pick up power, and out of the box, it was more prone to stalling than any other engine I’ve purchased in recent years. It traverses the double-slip switch on Susquehannock Industrial Park with great difficulty. To be fair, the double-slip does have two unpowered frogs, but my four-axle engines usually make it over just fine. 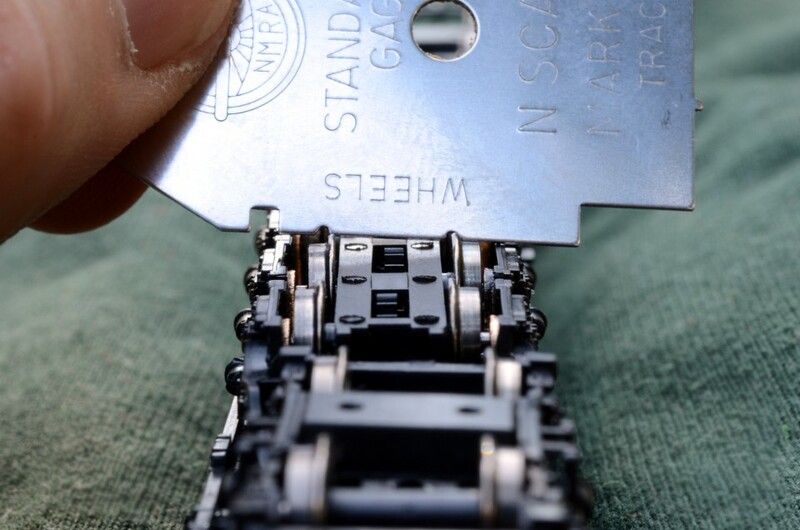 When I reached for my trusty NMRA gauge, I discovered that every axle on both units was gauged narrow. Every. Single. Axle. For the caboose cabin-car-chasing style of operation, this probably isn’t a big deal, but narrow axles are bound to have problems sooner or later with more complex trackwork. I went through all the wheels on the trailing unit, both powered, and non-powered, and regauged them. It wasn’t difficult, just time-consuming. It did seem to help a little with pickup. At some point, I’ll give the lead unit the same treatment. A Baldwin Centipede is the very last engine you want to find with every axle out-of-gauge. I took the engine to Chuck’s house, and ran it on his layout. He had just purchased a Centipede, too, and we noticed that both locomotives were stalling in spots that his Kato engines rolled right over. Some of those spots turned out to be dried-up Elmers from scenery work; things improved once those were cleaned off. A visit to Sam’s layout a few weeks later didn’t go so well, but his layout hadn’t been run in a while. I’ve taken it to the spring shows, and run it on T-Trak layouts, where it runs just fine. It had very little trouble on Kato turnouts. This is my first experience with a sound-equipped engine. As my clubmates have acquired various sound-equipped engines of their own, I’ve noticed that they’re also sensitive to track, and that they seem to improve with running. About the sound: it’s awesome. There’s plenty of room in those carbodies for good-sized speakers that deliver sound almost capable of carrying above train-show noise levels. The sound is loud enough to drown out Dave’s new Bachmann K4 when they’re running side-by-side. Not only does it have the usual array of engine-related noises, horn, and bell, but also things like “passenger announcements,” “farm background sounds,” and my personal favorite, “lumber background sounds.” Seriously. I work in a wood shop; why do they think I want to hear more of that on weekends? It’s been a very good year for good N scale locomotives. 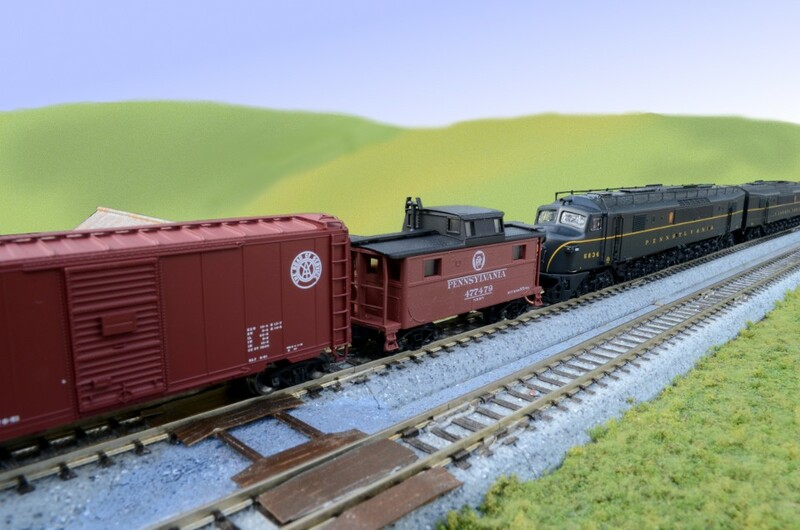 Besides the Centipedes, we’ve seen the introduction of Bachmann’s K4, Broadway’s Pennsy M1, and the Atlas S-2 switcher, all sound- and DCC-equipped. Several of the club’s remaining DC holdouts have purchased PowerCabs to run these new engines with. Pretty exciting stuff.